The warm Cuban music of Marcos Pereda and Kristine Robin fills the air at Yokayo Ranch as people move from table to table tasting dishes prepared by local chefs with food produced by local farmers at the second annual Farm to Table Benefit Dinner for the Good Farm Fund, a nonprofit formed last year to financially support small farmers in Lake and Mendocino counties. “All across the country, small farmers are struggling to be sustainable financially, and community support is a realistic solution,” says event co-organizer Chef Caroline Radiche of Black Dog Farm and Catering. Chefs Janelle Weaver and Daniel Townsend, owners of The Bewildered Pig in Philo, are serving a fresh county style pork pâté (Anderson Valley Community Farm) with minimal flavorings—thyme, white pepper, black pepper, salt and a bit of coriander—to keep the taste clean—on a crostini (Fort Bragg Bakery) topped with a choice of red onion chutney or an arugula pesto (Anderson Valley Community Farm). Chef Monica Almond is putting the finishing touches on lovely little mounds of sculpted Peruvian potato purée mixed with Meyer Lemon Olive Oil (Olivino) topped with a sliver of marinated red onion, a very small square of red pepper and a dot of Ají Amarillo hot pepper sauce. She and her son Hercule cook at Terra Savia and cater for parties and private events. Chefs Kelvin and Liz Jacobs of the Wild Fish Restaurant in Little River are serving up generous portions of sweet pink Salmon ceviche sprinkled with kale crisps (rub fresh kale with lemon, add chile, olive oil and salt; bake in high oven for 10 minutes; mix in food processor) served with a fava bean purée and a lettuce salad (Noyo Food Forest) with a side of salted tomato marinated in olive oil. The kale, tomatoes, herbs and calendula petals are from Cinnamon Bear Farm. Wild Fish Restaurant has been farm to table for five years serving fish and vegetarian entrées. “There’s no other way to cook than using our local food shed,” says Chef Liz. Two of the sisters from Kemmy’s Pies stand behind a table filled with slices of strawberry rhubarb pie made with organic, locally sourced ingredients. The rhubarb comes from Hearts Desire Farm in Willits; the strawberries are from Redwood Valley; and the crust is made from flour from the Mendocino Grain Project. It is a family affair with three sisters, Brenda, Kate and Amy, and their mother Kimberly starting out eight years ago by purchasing a commercial kitchen on wheels intending to make barbecue. A market in Laytonville wanted their pies and today they work from a remodeled kitchen at the Skunk Train Depot, that used to serve train customers, and sell 1,000 pies a week—that is, on a slow week—throughout Mendocino, Sonoma, Lake and Humboldt counties. Chefs Radice and Jason Pluck of Black Dog Farm and Catering cook at the Little Lake Grange Kitchen, a community kitchen in Willits. They have teamed up with Daniel Spiro, student life coordinator of the Grange School of Adaptive Agriculture, to present a plate of millet-based polenta topped with roasted chicken and sprinkled with black pepper chèvre (an acquired taste, to be sure) with a side of kale pesto. The millet, chicken and pesto ingredients were grown at the school and the goat cheese was made at Shamrock Artisan Goat Cheese, operating since 1983. Co-owner Ana Cox describes the importance of the farm to table movement. Chef Fabricio Giammei of Tango Foods stands behind a large platter of boneless pork (Potter Valley Unconventional Agriculture) and a Leg of Lamb (Magruder Ranch). He uses a sprig of rosemary to top the meats with a splash of traditional Piedmontese sauce and adds a side of beets (Tequio Family Farm). 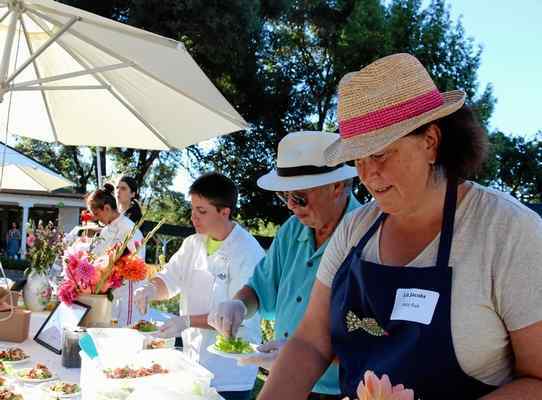 Event organizers—Scott Cratty, manager of the Ukiah Farmers Market; Sarah Bodner, local food supporter and community organizer; Bridget Harrington, chef at Patrona; Nicholas Petti, owner of Mendo Bistro and college teacher; and Radiche—spent months organizing the 19 chef and farmer pairings serving at the event. “All the chefs volunteered, and this year we were able to pay the farmers for their produce,” says Radiche. 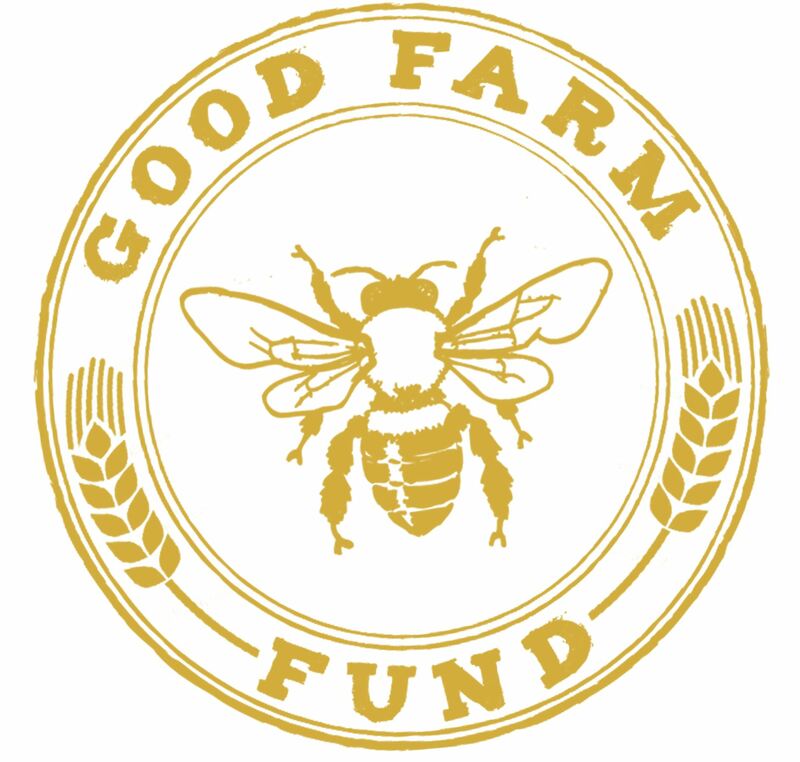 The Good Food Fund raised $7,000 last year and distributed the money to nine local farms helping them purchase seed stock, drought sensitive irrigation supplies, new hand tools and fencing. “Last year’s grants were modest—anywhere from $500 to $1,200,” says Radiche. “We’ve been gathering a huge amount of community support and now have $10,000 for this year’s grant cycle. We would like to increase our impact. “If a farmer needs to drill a well, we would like to be able to fund that. We want to support life changing purchases for these farmers,” she says. Event sponsors include Sip! Mendocino, Yokayo Ranch, North Coast Brewing, Mendocino Winegrowers Inc., the MendoLake Food Hub and Thompson’s Party Rental.